Montepulciano is in south-east of Tuscany region, where it stands high on a rocky ridge overlooking the picturesque landscapes of the Crete Senesi area - it is one of the highest hill towns in the region. It is a charming town with numerous interesting monuments and renaissance era palazzos and ancient streets and alleys to explore as well a couple of important churches. The town has been granted the Italian Orange Flag award for its programme of sustainable tourism. Italy This Way comment: Montepulciano is one of our favourite Tuscan towns and as well as being a gem in itself is a good base for exploring the region. If you possibly can stay in the town itself. It is charming by day but is also very atmospheric on an evening when everyone is sat outside at the restaurants and bars enjoying the warm evenings and the good food and wine. The town is entered through one of the original gateways through the ancient city walls - either Porta delle Farine to the south, at the highest end of the town next to the fort, or Porta al Prato to the north. You will enter on foot as only the locals are allowed to take their cars into the historic centre. There are a number of car parks but they fill up quickly so aim to get there early. There is quite a slope climbing from the north of town to the south so be prepared! 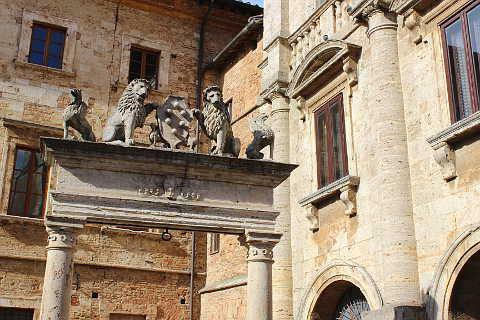 The centre of a visit to Montepulciano is Piazza Grande, which is surrounded by lots of buildings in medieval and Renaissance style. Take a look first at the Palazzo Communale, which is very reminiscent of the Palazzo della Signoria in Florence. You can climb the tower here to reach the highest point in Montepulciano and admire the lovely views acros the vineyards of the region. The beautiful Palazzo Contucci del Monte also stands out, and dates from the second decade of the 16th century. Originally built by Antonio da Sangallo the Elder and then finished by Baldassarre Peruzzi this is a palace of great beauty with its stone structure and numerous decorations, especially the portal and windows. The Nobili-Tarugi Palace is also very elegant and next to the Palazzo del Capitano del Popolo. Both these palaces are clad in travertine, as is the 16th century well decorated with griffins and lions. In the second half of the 18th century the palace underwent considerable renovation, which caused the unfortunate disappearance of a travertine marble staircase that led to the first floor, on the side of the palace that overlooks the Piazza Grande. Opposite these palaces stands the rugged mass of Montepulciano Cathedral, built in the late 16th and early 17th centuries by Ippolito Scalza, beside a square bell tower and leading up to slender double lancet windows. The interior of the cathedral has three naves and is famous for the precious works of art it contains such as the monument dedicated to Bartolomeo Aragazzi, an archpriest of the Cathedral (1427), by the great Michelozzo Michelozzi and the famous "Assumption" by Taddeo di Bartolo from the early 15th century. To the sides of the main altar are two statues, which form part of the Aragazzi monument, representing allegorically the virtues of 'fortitude' and of Justice and Faith. Continue south along Via Fiorenzuola and then Via della Fortezza and you arrive at the fortress which was the heart of the first fortified citadel of the ancient city walls, later reinforced with two boundary walls. 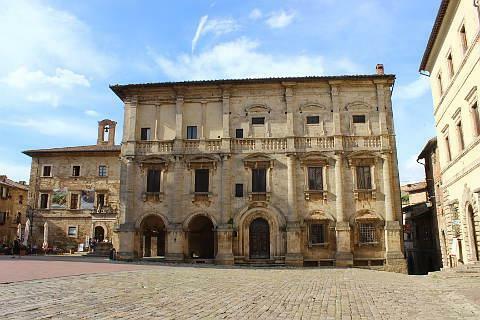 Heading north from Piazza Grande, the medieval appearance of Montepulciano is particularly visible in Via Ricci where you can admire the Palazzo Ricci, attributed to Baldassarre Peruzzi (1481-1536) and the Neri Orselli Palace (now the seat of the Civic Museum). 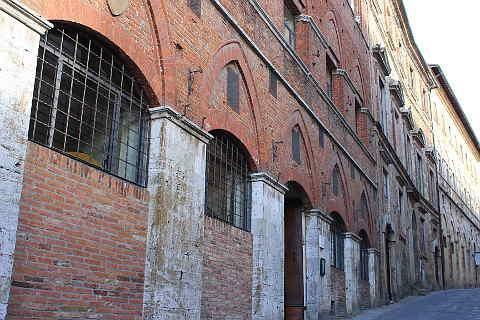 You quickly reach the Chapel of St. Antonio and Palazzo Benincasa, and then reach the Church of Saint Francis. The church portal is sharply arched in the Gothic style, and on the altars you can admire some ancient sacred tablets. Slightly further north is the Church of Saint Augustine, with a façade by Michelozzi (1396-1472) in an elegant Renaissance style. The portal has a narrow bezel topped with a gable with two thin flame towers, reminiscent of gothic style. The rest of the façade was probably completed by another architect who incorporated patterns of the Renaissance style. The inside of the church was remodelled in the 18th century. It contains art works by Federico Barocci (1535 ca.-1612), Alessandro Allori (1535-1607) and Lorenzo di Credi (1459-1537), and on the Altar there is a wooden crucifix, attributed to Donato di Niccolò di Betto Bardi, calle “Donatello” (1386-1466). From here, on either side of the Via Roma there are palaces echoing the Renaissance style: the Palazzo Cocconi-Del Pecora, designed by Antonio da Sangallo the Elder and the Palazzo Buccelli with Etruscan urns and plates inscribed in Etruscan and Latin. You are now close to Porto al Prato, one of the original gateways through the defensive walls that once protected Montepulciano. There are some wonderful views over the countryside from here. More good views can be seen from Via di Collazzi. These views are particularly picturesque because they look out onto the beautiful domed San Biagio church which sits below Montepulciano. These views and the ones from the opposite side of Montepulciano from the Via Fiorenzuole Vecchia were among the best of our tour around Tuscany. There are restaurants and bars and wine cellars all around the town. The choice and quality is excellent. 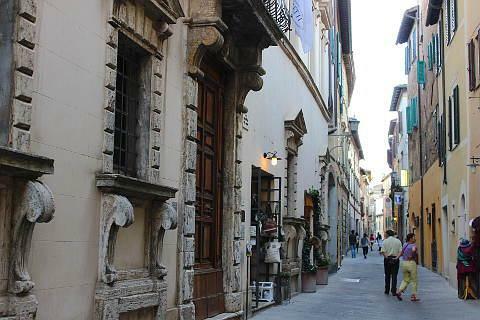 If you need a bank or shops then the Via di Gracciano nel Corso is the main shopping street. The weekly market is held in Piazzale Nenni on Thursday mornings. The collections of the town museum are divided into four main sections. The first section is devoted to inscriptions, ceramics and metals, among them the 16th century "Marzocco" (the symbol of subjugation of the city by Florence), and the armorial bearings of the Cocconi and Cervini families. Among the ceramics, there are many household objects found in the well and basement of the building, dating from the 13th and 15th centuries. The archaeological section contains Etruscan funerary objects dating to the 6th-4th centuries BC. The Art Gallery holds works by many artists from Siena such as the Crucifixion by Luca di Tommé, the Coronation of the Virgin by Angelo Puccinelli, the Madonna and Child with St. John the Baptist attributed to Bernardino di Betto and the Holy Family with St. John the Baptist by Antonio Bazzi. There is also a special section devoted to the terracotta of Andrea della Robbia including the "Saint John the Baptist" and a bust depicting “The Redeemer” while one of the most celebrated works in the museum is the 13th century "Saint Francis" by Margaritone d'Arezzo. 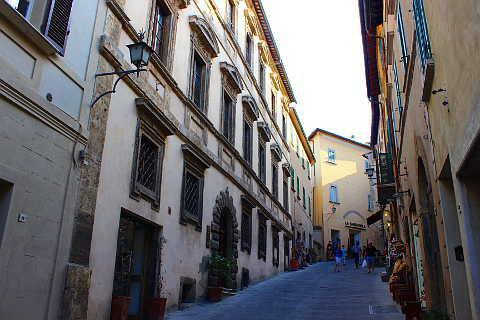 Fans of Stephenie Meyer's Twilight novels will know that the fictional home of the powerful Volturi vampires is in the nearby town of Volterra. Most of the filming however took place in Montepulciano and particularly the Piazzo Grande. In New Moon Bella runs across the square (to which a fountain has been added) to stop Edward from exposing himself as a vampire on the steps of the Palazzo Communale. In open countryside outside the city the Church of the Madonna di San Biagio by Antonio da Sangallo the Elder (1453 ca.-1534) is another highlight. This church was built on the ruins of the ancient parish church of San Biagio and has a Greek cross plan. It is surmounted by a cupola, with four arms of equal length while the interior consists of large arches and classical decorative elements such as pediments, metopes, triglyphs and niches. The main altar is the work of Albertini (1584). Some of the paintings, such as the “Coronation of the Virgin”, are attributed to Zuccari (16th century). Opposite the church you can see the Rectory of St. Biagio, and next to it is a well similar to that in the Piazza Grande. Health enthusiasts will also enjoy discovering the famous thermae (spas) close to Montepulciano, with a local mineral water particularly rich in carbon dioxide that has antiseptic, antispasmodic and anti-allergic properties. The baths are about five kilometres from Montepulciano and three kilometres from Chianciano Terme. 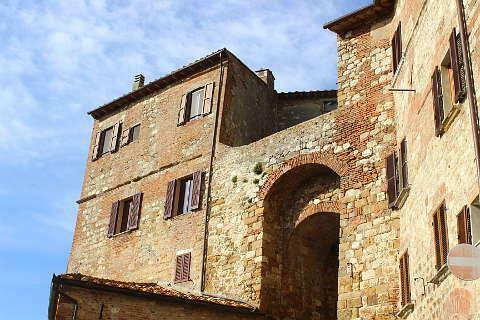 Other places of particular interest close by include Pienza and the etruscan town at Chiusi. 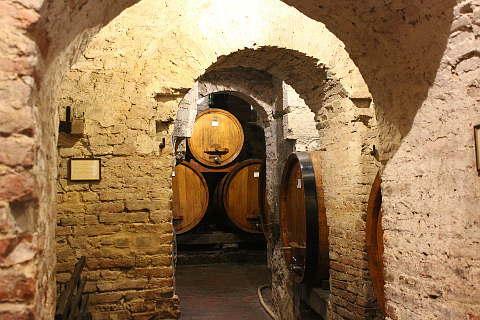 Montepulciano is also famous for its wines, such as the Vino Nobile di Montepulcianno which is a high quality wine that was already famous in Etruscan times. We should also mention the Brunello and Vino Santo. These wines are of course to accompany dishes typical of the traditional cuisine of the Siena region, such as the so-called 'black crostini, an hors d’oeuvre prepared with bovine spleen, onion, white wine, anchovies, capers, salt and pepper, smeared on slices of toasted homemade bread. Among the first courses we recommend the Pappardelle with hare. Among the main courses, the Tagliata, a steak cooked on the grill and "cut" in small slices then finished with lemon juice and rocket leaves is very tasty.